ClickBank pays you 30% for each Business Plan Secret Revealed! e-book you sell. Put your actual clickbank nickname where it is highlighted yellow. Click here for business plan articles for your site. 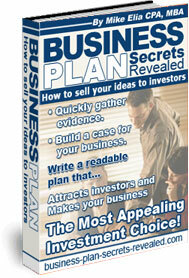 Click here for Business Plan Secrets Revealed book and Free Business Plan Guide pics and banners. You can copy and paste these JPG files to use on your website. Use the graphics as links and banners on your site. Simply Right Click and save to your hard drive. Build content for your site and direct traffic to purchase Business Plan Secrets Revealed...copy and paste any of these articles to your site. Be sure to include your Clickbank hoplink. When you make any statement or claim in your business plan, don't think about how it comes out of your mouth; think about how prospective investors’ will hear it. If you do this, you just might catch yourself thinking this statement sounds ridiculous, non-compelling, or worse yet... not very convincing. Your business plan must convey a message that compels prospective investors to conclude, "This is the business venture and team I want to back." To judge whether or not the statements you write in your business plan are truly compelling – before you actually put them in front of potential investors – use this simple evaluation. Ask yourself if the claim or statement would trigger a prospective investor to respond by saying "Well, I would expect so!" To illustrate this, let’s say you’re describing in your business plan why a customer would favor your business over your competition. After you write the statement use the "Well, I Would Expect So" evaluation and see if the answers hold weight. To show you what I mean, consider a start-up aircraft lighting company that explained why airlines would chose them over traditional equipment providers by saying: "We offer brighter, more reliable, aftermarket lighting systems." Can’t you hear a prospective investor exclaim, “Well, I would expect so! You're in the lighting business! Isn't that what you’re supposed to do?” See how weak this statement sounds? Now suppose they said something like this: “At three- hundred miles per hour, our lighting systems give pilots 250 more yards of visibility and 4.2 seconds more reaction time to avoid potential disasters.” Do you think this would spark the same type of response? I don’t think so. Let’s take another company. This one plans to develop a national chain of personal beautification centers. Here’s their differentiation claim, "We help people look their best." Well, I would expect so. What else would you expect them to say? "Hey, we're lousy. We'll make you look worse than before and have you back to work in no time." You've got to articulate what you do better than that. Force yourself to break away from the usual platitudes and generalities of lazy communicators and say what you need to say well. Use this important evaluation question whenever you make any claim in your business plan. In fact, apply this test right now to each section of your business plan. Then honestly evaluate your answers against the "Well, I would expect so!" evaluation. Go ahead, pick any section of your business plan and apply this evaluation to each of your claims. If your statement produces a mind numbing “Well I would expect so” response, then you can bet your prospective investors will have the same reaction to it. After you complete one section of the plan, move on to the next. Do they pass the "Well, I would expect so!" evaluation? If not, be more articulate and change the statement immediately. It’s sad when businesses with truly differentiated advantages either don’t take the time or don't know how to articulate their superiority. They settle for "Well, I would expect so!" verbiage in their business plans and fail to build a case for their respective businesses that lead investors to conclude that their venture is the obvious investment choice. Here’s the take away. Realize that you can make your business plan more compelling, help potential investors draw better conclusions, and build a better case for investing in your business venture than just churning out lazy statements with little or no meaning. Mike Elia is a chief financial officer and advisor to venture capitalists and leverage buyout specialists. 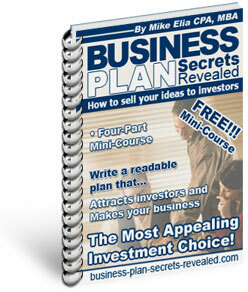 His manual < a href="http://hop.clickbank.net/?yournicknamehere/webprods">Business Plan Secrets Revealed< /a> shows how to make your business the most appealing investment choice. Remember Papa John's commercial on TV with the slogan "Better Ingredients, Better Pizza"? Well its nothing more than puffery: general, non-provable, inane claims. The problem is puffery is not only acceptable it's often expected. Phrases like “the biggest,” “the best,” “the cheapest,” and so forth are so over used most people simply ignore them. Aren’t puffery, platitudes, and generalities all the same thing? You bet they are. And if you believe Mr. Hopkins, these kinds of statements roll off the human understanding like water off a duck's back. They make no impression whatsoever. I don't know about you but if I'm spending my money and time writing a business plan to raise capital for my business, I want it to make an impression! Now, suppose this construction management company explained their “unique” process, provided cost comparisons, and gave the actual length of time to complete their last twenty projects against industry standards for similar projects. And, suppose they provided customer testimonials to back their figures. Would this be more believable? More convincing? Okay, I think we beat puffery to death already; it's pretty straightforward. To summarize, let me repeat Claude Hopkins’ quote: "Platitudes and generalities roll off the human understanding like water off a duck's back. They make no impression whatsoever." So use the puffery sensor as you write and review the statements in your business plan. Simply ask yourself, "Will my potential investors really believe this?" If the answer is no, dig deeper for the evidence that will convince them.